Ssssh! 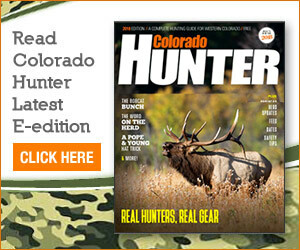 Here’s one of Colorado’s best kept hunting secrets. For residents seeking to avoid the expense of guides, outfitters or access fees, more than a million acres of prime private wildlife habitat is open to the public on a limited basis under the state’s Ranching for Wildlife program. Licenses for these private land hunts, available only to residents, cost the same as any public land hunting license. But this makes them popular and hard to get. Trophy hunters have to wait years to get enough preference points—up to 15 for a bull elk or a buck deer on some ranches. Doe and cow elk hunters need fewer points but are subject to the luck of the draw. Hunters seeking licenses to hunt on a Ranching for Wildlife property must plan ahead, since these licenses are available only through the big game license draw. The payoff is quality hunting on a private ranch with a 65 to 95 percent success rate. Initiated in 1985, Ranching for Wildlife is limited to ranches with at least 12,000 contiguous acres that contain a significant number of species for which licenses can be drawn—elk, deer, pronghorn, bear, turkey, moose and bighorn sheep. The program now encompasses more than 24 ranches. Participating landowners must have an acceptable management plan to improve wildlife habitat on their properties. Some ranches make special contributions to managing threatened and endangered species. Others have dedicated significant perpetual conservation easements. Many provide youth hunting opportunities, special public seasons, and offer exceptional services to public hunters. All ranches must provide free public access to hunters who draw a limited license for the property. Case in point: Wolf Mountain Ranch, a 25,000-acre working ranch north of Hayden offering some of northwest Colorado’s most pristine hunting acreage. In 2009 the ranch teamed up with CPW’s Ranching for Wildlife program through Vanatta Outfitters. Of the ranch’s acreage, 16,000 acres is available for hunting. The program allows the land owners and outfitters to receive a guaranteed number of tags based upon the quantities of game on the ranch. With these tags comes a 90-day hunting season window. The number of licenses issued on these ranches and the season dates are determined through negotiations between the landowner and CPW, with 10-20 percent of the male licenses and 100 percent of the female licenses allocated to the public. In return, landowners receive 80-90 percent of the male licenses issued for their properties, for which they can charge hunters fees to access the land. They also are allowed up to 90 days to hold their hunts. Both the public and the private seasons can start earlier and run later in the year than regular rifle seasons. Ranching for Wildlife coordinator Jerry Apker says some ranches with resident herds manage their big game populations to increase the age and size of their animals, offering true trophy hunts. Other ranches simply play host to migrating herds usually under little hunting pressure. Licenses issued for these ranches can only be used on the specified ranch. The public hunters are given the same access to the private property as those who pay a fee. Wildlife managers and the landowners, however, often work out additional conditions to spread hunting pressure and to relieve concerns about security and liability. Successful applicants receive information on ranch rules well before their hunts. Each hunter is usually allowed to bring one non-hunting companion. Each must sign a liability release and check-in and check-out with the landowner. Hunters may have to camp on adjoining public land or secure lodging in the nearest town. More than 3,000 Ranching for Wildlife licenses are available each year, with most recipients maintaining it’s well worth the wait. The Ranching for Wildlife website (cpw/state.co.us/bg/rfw) lists the number of public licenses issued per ranch, the number of preference points needed and hunter success rates for the previous year.